Palm Island is one of 16 Islands in the Palm Island Group. Located 65km north of Townsville in Cleveland Bay, the community comprises 2,340 people. Historical research indicates that the Manburra people (pronounced Mun burra) originally occupied this region prior to first contact with Europeans. However, no determination has ever been made by the Federal Court. The contemporary Aboriginal name for Palm Islanders is ‘Bwgcolman people’ (pronounced Bwook-a-mun), which means ‘many tribes – one people’. Many of today’s community members are descendants of Aboriginal and Torres Strait Islander people forcibly removed to Palm Island from throughout Queensland. The first recorded European visitors to the waters around Palm Island were British Royal Navy personnel. In 1770, Captain Cook named the Palm Island group during his exploration of the east coast of Australia. Near our landing-place were some natives' huts and two canoes; the former appeared to have been recently occupied, and were very snug habitations. They were of a circular shape, and very ingeniously constructed by twigs stuck in the ground and arched over, the ends being artfully entwined so as to give support to each other; the whole was covered with a thatch of dried grass and reeds. In 1883, 9 Palm Islanders were kidnapped by United States circus agent R A Cunningham and taken to the United States to become travelling exhibits in the Barnum and Bailey Circus. Most died obscure deaths overseas. One of the men kidnapped from Palm Island was known as Kukamunburra (or Tambo) and in 1993, his mummified body was found in the basement of a funeral parlour in Cleveland, Ohio. In 1994, Kukamunburra’s body was repatriated from the United States and laid to rest on Palm Island with full ceremonial rites. The settlement was established for Aboriginal and Torres Strait Islander people forcibly removed and relocated from throughout Queensland. In 1889, the Secretary of the Townsville Aboriginal Protection Association called for an Aboriginal reserve to be established on south Palm Island. No action was taken and Palm Island received only brief mentions in government reports in subsequent years. In 1897, the Queensland Parliament passed the Aboriginal Protection and Restriction of the Sale of Opium Act (the ‘Protection Act’). Under section 9 of the Protection Act, the Home Secretary was granted the power ‘to cause Aboriginals within any district to be removed to and kept within the limits of any reserve situated in the same or any other district’. In 1912, the Chief Protector of Aboriginals visited Palm Island and noted that there was a small Aboriginal settlement. Palm Island was gazetted as an Aboriginal reserve in June 1914 and in 1918, a cyclone destroyed the Hull River Mission and its remaining inhabitants were sent to Palm Island. This was the first of many transfers which, over the next 5 decades, would see many Aboriginal people and some Torres Strait Islander people removed to Palm Island. There were 3,950 documented removals between the years 1918 and 1972 with some people removed from as far away as Brisbane and Cloncurry. In the 1920s, 2 women from the Baptist church began missionary work with the Aboriginal population on the reserve. Between 1918 and 1924, Catholic priests visited the Palm Island Reserve. In 1930, Father Molony commenced missionary work on Palm Island and the Sisters of Our Lady Help of Christians established a presence there after a Catholic convent was built in 1934. The Catholic Church built a school on the Island in 1937. The Palm Island women’s dormitory closed in 1967 and in 1969 it was demolished. The children’s dormitories were officially closed on 5 December 1975. The adjacent Fantome Island was gazetted as an Aboriginal reserve in 1925. The following year the Fantome Island Lock Hospital was established and began taking patients suffering from venereal disease. By 1937, Fantome Island had become the health clearing station through which Aboriginal and Torres Strait Islander people would travel before being admitted to Palm Island. The Island was also used for tuberculosis patients and for convalescents from the mainland. In 1939 the Franciscan Missionaries of Mary took over the running of the Fantome Island hospital. Before it closed in 1973, the hospital also included a leprosarium which served as Queensland’s longest running Aboriginal-only medical segregation facility. Palm Island also has a long history of being used as a penal institution for Indigenous people who chose not to conform to the Protection Act, or who had committed criminal offences. A considerable number of men who had already served their sentences in jail were removed to Palm Island, effectively punishing them twice for the same offences. Since its inception, the Palm Island settlement has a history punctuated by unrest and violence. The first superintendent at Palm Island, Robert Curry, is reputed to have been a strict disciplinarian, who handed out lengthy imprisonments, public humiliations and floggings to those he perceived as threatening his control. His ultimate punishment was to exile individuals to nearby Eclipse Island with only bread and water. In the early hours of 3 February 1930, Curry shot 2 people and burnt down the staff buildings including his own house, killing his son and stepdaughter. He was later fatally wounded by Peter Prior, an Aboriginal man who acted under instructions from Assistant Superintendent Thomas Hoffman. After an investigation into the shooting, Peter Prior and Thomas Hoffman were charged with Curry’s murder. Peter Prior spent several months in jail before the case was heard by the Townsville Supreme Court on 14 August 1930. Justice RJ Douglas concluded that the case should have never been brought to trial as the men’s actions were justified, given the danger Curry posed to the community. The prosecution then decided to drop proceedings against the 2 men. The death rate on Palm Island was higher than the birth rate until well after World War II. The population only grew over time because of the large numbers of people removed to the Island. In 1932, Dr Thomas L Bancroft defined Palm Island as ‘the Black–fellows Graveyard’, reporting conditions of ‘filthiness and squalor’ and a ‘great mortality’ amongst residents. The anthropologist Norman Tindale visited Palm Island in 1938 where he recorded the genealogies of people representative of a large number of tribal groups from across the state of Queensland. Throughout World War II, ‘Palm Island became the site for the Black Cat Squadron which flew Catalina flying boats on long range missions’. In 1943, a maintenance facility had been constructed near Wallaby Point by the US Navy to allow the flying boats to be hauled up onto dry land for maintenance and repairs. Until the early 1970s, there were morning roll calls and nightly curfews for Palm Island residents. The settlement bell rang each morning at 8am, which was the signal for everyone to line up for parade and for allocation of work for the day. Anyone missing was punished by being deprived of food. At 9pm each night, the bell rang signalling the shutting down of electricity. The harshest period was in the 1950s when Superintendent Roy Bartlam arrested workers for being a minute behind the roll call. There had been a series of disturbances on Palm Island since the settlement was established but no organised, collective and open revolt occurred until 1957. During this period the residents of Palm Island staged a strike against the harsh conditions imposed by Superintendent Bartlam and demanded improvements to housing and rations as well as increased wages. The residents also demanded that Bartlam leave the Island and he was forced to flee to his office and call for reinforcements from Townsville. Armed Police arrived by RAAF launch to put down the disturbance. The ‘ringleaders’ and their families were rounded up and marched on board the launch at gun point before being deported in chains to other Aboriginal settlements. Seven Palm Island Elders lodged complaints with the then Human Rights and Equal Opportunity Commission (HREOC) in 1985, alleging that the government had unlawfully discriminated against them by failing to pay them award wages between 1975 and 1984 in breach of the Racial Discrimination Act 1975 (Cth). In 1996, a HREOC inquiry conducted by Commissioner Bill Carter found that the government had “intentionally, deliberately and knowingly discriminated against the complainants” through payment of wages at less than award rates. As this discrimination was found to be based on the race of the complainants, they should be compensated for their loss. The Queensland Government initially refused to abide by Commissioner Carter's recommendations and the complainants, with the assistance of the Foundation for Aboriginal and Islander Research Action (FAIRA), took their case to the Federal Court. The Queensland Government reconsidered its position after Justice Drummond recommended the parties pursue further mediation. The Queensland Government published an apology expressing its 'regret for the personal hurt suffered by each of the complainants as a result of the discrimination'. The 7 Palm Island Elders were each paid $7,000 in compensation as awarded by HREOC. This action by the Palm Island Elders was the catalyst for the subsequent Queensland Government Underpayment of Award Wages process that compensated over 5500 Indigenous Queenslanders who had also been paid under-award wages. Two deaths in custody have occurred on Palm Island in the recent past. The first was in 1961, when Henry Pitt died after being allegedly assaulted by a Palm Island policeman while in custody. The second death occurred on 19 November 2004, when Mulrunji was found dead in a cell at the police station on Palm Island. A post-mortem examination showed that he had died from severe internal injuries. Following the release of the post-mortem examination results, there was rioting on Palm Island. In the aftermath of the riot, several people were charged with offences. Two coronial inquests were held into the death of Mulrunji before a police officer was tried for manslaughter and acquitted on 20 June 2007. In 2007 the Queensland Government tasked the Crime and Misconduct Commission (CMC) with examining police relations in Queensland as a result of the events on Palm Island, which resulted in the CMC conducting an inquiry into police handling of the investigation of Mulrunji’s death. In its 2010 report, the CMC noted that while police relations had improved, more work was needed. It recommended 51 actions across seven areas of focus. On 30 March 1985, the Palm Island community elected 5 councillors to constitute an autonomous Palm Island Aboriginal Council established under the Community Services (Aborigines) Act 1984 (Qld). The Act conferred local government type powers and responsibilities upon Aboriginal councils for the first time. The council area, previously an Aboriginal reserve held by the Queensland Government, was transferred on 27 October 1986 to the trusteeship of the council under a Deed of Grant in Trust (DOGIT). On 1 January 2005, under the Local Government (Community Government Areas) Act 2004 (Qld) (the ‘CGA’), the Palm Island Aboriginal Council became the Palm Island Aboriginal Shire Council. Australian Bureau of Statistics, Census of Population and Housing, 2011, Indigenous Profile - I04 (release 1.1). Palm Island Aboriginal Shire Council Welcome to the PIAC <http://www.piac.com.au> at 13 February 2013. James Cook and Sir William James Lloyd, Captain Cook's Journal during his first voyage round the world made in H.M. Bark ‘Endeavour’ 1768-71 (E Stock, United Kingdom; 1893). Captain Phillip Parker King, Narrative of a Survey of the Intertropical and Western Coasts of Australia Performed between the years 1818 and 1822, Vol I (John Murray, Australia: 1826), ch.5 at p 197. Penelope Layland, Captive Lives, Moving Stories, (National Library of Australia News, Australia: 1998). Department of Colonial Secretary, Correspondence in relation to the proposed Mission Station on South Palm Island (COL/A595, 89/9668). See also Christopher Anderson, Queensland Aboriginal Peoples Today at p 303 in J H Holmes (ed.) Queensland: A Geographical Interpretation, (Royal Geographical Society of Australasia, Australia: 1986). Unknown Author, Protecting the Aborigines, Brisbane Courier, 23 October 1912. Information retrieved from the Community and Personal Histories Removals Database. Queensland, Department of Native Affairs Annual Report, (1924): 8. Joanne Watson, Becoming Bwgcolman: Exile and Survival on Palm Island Reserve, 1918 to the Present, (University of Queensland, Australia: 1993). Departmental Files SRS 4322/1, Ref GF/56; 23/7/1970. Queensland, Queensland Government Gazette, 17 October 1925. Queensland, Department of Native Affairs, Annual Report (1927): 5 - 6. Queensland, Department of Native Affairs, Annual Report (1937): 7. John Maguire, Catholic Missions to the Aborigines in North Queensland, Lectures on North Queensland History no.4, James Cook University (1984) < http://espace.library.uq.edu.au/eserv/UQ:241819/Lectures_on_NQ_History_S4_CH3.pdf> at 19 March 2013, pp.65-68. Meg Parsons Defining disease, segregating race: Sir Raphael Cilento, Aboriginal health and leprosy management in twentieth century Queensland, Aboriginal History Volume 34, 2010, Australian National University, EPrints at: https://press.anu.edu.au/publications/aboriginal-history-journal-volume-34 at 20 September 2013. Joanne Watson, Palm Island Through a Long Lens, (Aboriginal Studies Press, Australia, 2010). Ibid, Australian Dictionary of Biography entry for Robert Curry; Sydney Morning Herald, 15 August 1930, p.11 <http://trove.nla.gov.au/ndp/del/article/16665179> at 9 November 2012. Maguire, above n 19, p.64. Western Mail, 20 May 1933, John Oxley Library, S.W. Jacks, Cutting Book No. 10, p 12 in Joanne Watson, Palm Island Through a Long Lens, (Aboriginal Studies Press, Australia: 2010) at p 84. Watson, above n 21 at p 89. Naval History and Heritage Command 55th Naval Construction Battalion: Historical Information (unknown date) <http://www.history.navy.mil/museums/seabee/content/UnitHistory.pdf> at 17 October 2012. Queensland, Queensland WWII Historic Places: Palm Island Airfield <http://www.publicworks.qld.gov.au/sites/qldwwiiplaces/pages/Places.aspx?PlaceCode=QWWIIHP-1076> at 17 October 2012. Thalia Anthony, Palm Island: Paradise to Prison? Colonisation Through Criminalisation, (Speech delivered at the Macleay Museum, New South Wales, 27 August 2009) at p.104. Joanne Watson, Palm Island, Queensland Historical Atlas <http://www.qhatlas.com.au/content/palm-island> at 11 October 2012. HREOC is now referred to as the Australian Human Rights Commission. Bligh & ors v State of Queensland  HREOCA 28; (1996) EOC 92-848 at 79,290. Jonathon Hunyor, Stolen Wages: The Way Forward, Human Rights Law Bulletin Seminar, 9 March 2007. Last accessed 19 September 2012 at http://www.hreoc.gov.au/legal/seminars/speeches/stolen_wages_hunyor_mar07. Office of the State Coroner, Finding of Inquest: Inquest into the Death of Cameron Doomadgee, Townsville, COR 2857/04 (9). Robyn Ironside Palm Island riot ringleader Lex Wotton set free but banned from speaking to media, Courier Mail, 19 July 2010 last accessed 19 September 2012 at http://www.couriermail.com.au/news/queensland/palm-Island-riot-ringleader-lex-wotton-set-free-but-banned-from-speaking-to-media/story-e6freoof-1225893772320. The Inquest dates were 27 September 2007 and 14 May 2010. For further information, refer to Office of the State Coroner, Finding of Inquest: Inquest into the Death of Cameron Doomadgee, Townsville, COR 2857/04 (9), 27 September 2006; Office of the State Coroner, Finding of Inquest: Inquest into the Death of Cameron Doomadgee, Townsville, COR COR 2857/04(9), 14 May 2010. Hurley v. Clements & ors  QDC 323; Hurley v. Clements & ors  QCA 167. Crime and Misconduct Commission Annual Report 2010-11. 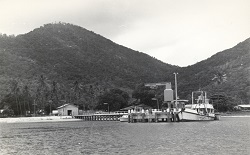 Boat at Palm Island jetty (date unknown).